Chemicals damage hair not only externally but cause havoc on the internal genetic makeup found in the cortex of the hair shaft which is in essence, the hair’s ‘print’ (map). 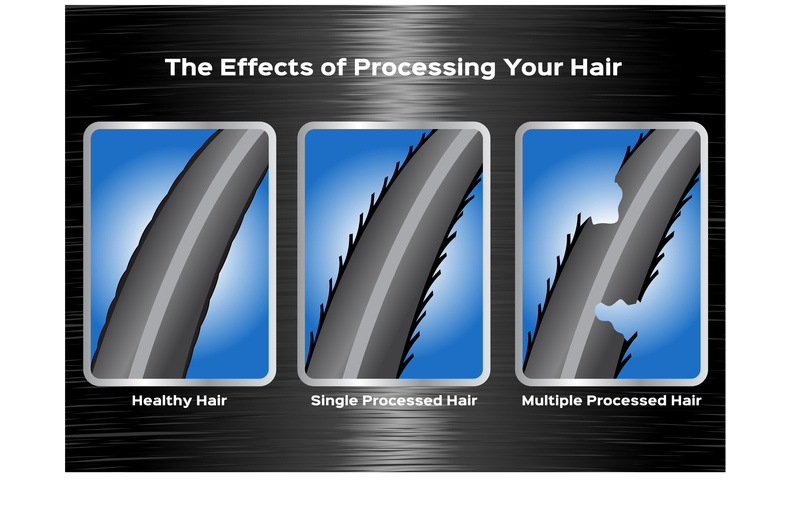 The print or map of your hair shaft is often no longer present in chemically treated hair. Chemically damaged hair is more porous than healthy natural hair. It takes time and nurturing to restore chemically damaged hair back to its natural state. Hair dyes, perms, relaxers, and wave products change the natural hair matrix while doing what they are tasked to do. Aside from the fact that chemicals can cause acute dermatitis without warning, these chemicals are electron scavengers that take any atom they can find, including from cells inside the hair follicles. This damages the melanocyte and keratinocyte cells in the follicle (these cells make your skin and hair colour). Over time, this may accelerate the rate at which your hair loses its colour, and causes grey with diminished quality. The result is hair that is dull, thinner and brittle. If you make a start the journey, your hair will be healthier long into your life. If your hair is chemically damaged and you are experiencing severe split ends and brittle/broken hair, this extent of pre-existing damage makes the hair fragile and possibly prone to further damage. The best cure for damaged hair is healthy new growth. We only recommend treating new growth when your hair and scalp are ready. It will be best to rebalance both before using HAIRPRINT. 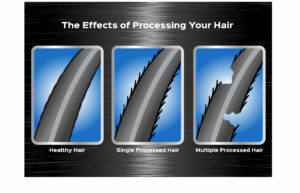 It’s a process to restore the vitality of the hair but well worth it! *Our selection of shampoos and conditioners can facilitate this, remove residues and prepare the hair while you grow out your roots for a HAIRPRINT application. Make sure you are using the right colour. If you are not getting the results you want and need any guidance, please complete the free advice form or make contact. We are here to help.